Advanced Fantasy Baseball: Is Adrian Gonzalez a 2013 Fantasy Baseball Bust? Is Adrian Gonzalez a 2013 Fantasy Baseball Bust? I have been writing quite a bit lately about the various position tiers of fantasy baseball. If you have been following here and in Big League Magazine (you should subscribe!) you will know that I believe the top tier at first base to be much smaller than most seem to expect. I am about to share with you my reasoning on one of the players typically expected to be in the first tier this season but who I believe is in the midst of a serious decline in production - Adrian Gonzalez.You will find my first base tiers and some brief comments on each player below the Adrian Gonzalez portion of this article. First basemen have a reputation in MLB as well as in fantasy as being the biggest bats in the game. These are the guys that find their way into lineups regardless of defensive limitations or lack of running speed based on the quality of their hitting skills alone. We expect them to hit for average and for lots and lots of power. If we ran a poll of what fantasy owners wanted from their first baseman I have no doubt power would rule the day. Personally, I believe that high batting averages and big power are essential qualities in a top tier first baseman. First baseman typically do not steal bases so if they do not hit for average they become three category players. I don't know about you but if a player covers less than four categories he is moving way down my list. When Adrian Gonzalez was with the San Diego Padres he was a very good first baseman with outstanding numbers, especially considering he was playing most of his games in the sport's least favorable hitting environment. His batting averages were usually in the .275-.285 range with 30-plus homeruns per season. As a Padre he was a serious threat to score 100 runs and collect 100 RBI every season. He probably peaked during the 2008-2009 seasons when he hit 36 and 40 homers. His isolated power has declined in each of the three years since that peak. He went from a high ISO of .274 in 2009 with 40 homeruns to just .164 in 2012 when he hit just 18 homeruns between the Boston Red Sox and Los Angeles Dodgers. Gonzalez suffered a shoulder injury in May of the 2010 season. He played through the pain the entire season and had what was initially expected to be relatively simple surgery in October of that same season. The surgery was often referred to as "cleaning up the shoulder". Later it was revealed that the rehab could take up to five months. This meant that even if he started the season on time there was a significant risk that he would still lack ideal strength in the joint. This had the potential to sap his power and make him a far less productive power hitter. That did not happen but his skill indicators still took a fall even as his production remained strong. While rehabbing the shoulder Gonzalez, who had implied he would not be returning to the Padres when he reached his impending free agency, was traded to the Boston Red Sox. They were very aware of the shoulder problem but did not seem at all worried about it. Fenway Park tends to boost batting average and slugging percentage while robbing batters of homeruns. So Gonzalez seemed quite productive in 2011 despite power numbers that might seem disappointing when compared to his San Diego numbers. Few noticed that his .380 BABIP seemed very much out of character. His groundball rate rose dramatically with a corresponding decrease in flyballs. He was swinging at many more pitches out of the strike zone but he was making slightly better contact as well, even as he drew fewer walks. Before the 2012 season the Red Sox signed Gonzalez to a seven year $154 million dollar contract. Gonzalez started very slow in 2012. He had just 6 homeruns through the end of June. His batting average was relatively mediocre until a brief BA surge in June. This was despite a first half .327 BABIP. His line at the end of June was just .283/.329/.416 with 6 homeruns, 45 RBI and 42 runs. That would have been a pretty good line for your shortstop (assuming you were getting steals somewhere else) but for your first baseman it was atrocious. There are lots of theories about what happened. For some it was the Bobby Valentine Effect. Just about anything that went wrong in Boston during the 2012 season has been laid at the feet of their former manager. However, there had been a clear change in skills and approach. The trade to the Dodgers seemed to make him happy. He was back on the West Coast and overall his second half was much more productive - .317/.361/.517 with 12 homers, just 33 runs but 63 RBI and even two stolen bases. But can you count on Gonzalez to repeat his second half numbers? His second half BABIP of .342 is high but not ridiculous for Gonzalez given his career .324 BABIP. His walk rates have come way down since his peak. That has a lot to do with earning fewer intentional walks but that is not all of it. It could be a sign that his bat is not as feared around the league as it once was though it could also be that he now plays in deeper lineups. He is now a far less discerning batter, he has begun swinging at just about anything within reach. His power has declined three years running in dramatic fashion. His batted ball types tell that tale. He has become more of a groundball hitter with declining FB%, ISO, HR/FB% and obviously homerun totals.He has been hitting more doubles but that was primarily in Fenway Park. The Boston doubles could become long outs. If the BABIP scores regress to career levels or worse he could be a complete disaster at his present ADP. 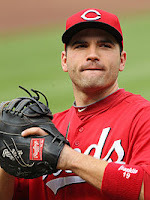 Joey Votto, Cincinnati Reds - The ideal first baseman is like Votto a five category contributor in a great lineup. The knee injury should not a concern. This could be his career year. Prince Fielder, Detroit Tigers - Fielder has been very durable but has up and down power numbers. If the pattern holds this should be a up year for Fielders homerun totals. Albert Pujols, Los Angeles Angels - The best player in the game until 2012, I don't think this is the end. Other than April and September he was pretty much Pujols as usual. Billy Butler, Kansas City Royals- The power everyone wanted arrived but it was mostly a HR/FB illusion. His ridiculous slow (I mean Bug Bunny slow pitch slow) running speed will keep his run totals low. Mark Teixeira, New York Yankees - The shift is killing his batting average but he still has serious power. The imploding Yankees could erode his RBI totals. Allen Craig, St. Louis Cardinals- If he could stay healthy he might move up a tier. He hits for average and could hit 35 homers if he ever got a full season of at-bats. Edwin Encarnacion, Toronto Blue Jays - A few years later than expected, E5 has arrived. An improved O-Swing was a big factor. He steals a few bases too. 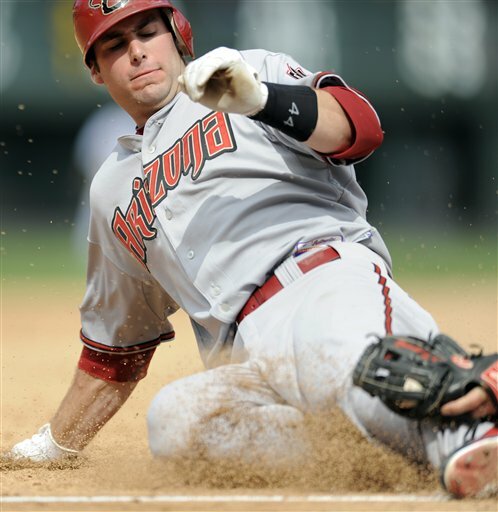 Paul Goldschmidt, Arizona Diamondbacks - Everybody's new favorite has even more power than this. There is some average downside in his O-swing, and strikeout rate and it would be foolish to expect 18 stolen bases again. Paul Konerko, Chicago White Sox _ He is starting to slow down but he is such a good hitter that it may take a few more years to convince most fans. The White Sox have no one to replace him with anyway. 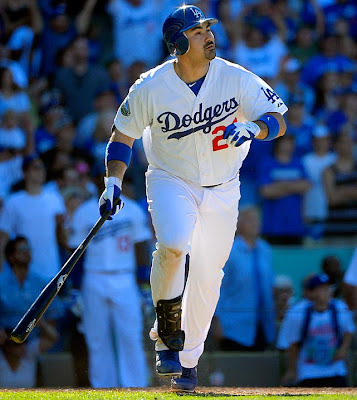 Adrian Gonzalez, Los Angeles Dodgers - A talented player holding a lot of risky indicators. He should probably move down a tier. But unless you skipped the above article you know all that. You might have known anyway. Adam LaRoche, Washington Nationals - He might be in the second tier if he was consistently healthy. If I owned him this season I would move Tyler Moore up my list of reserve picks. Freddie Freeman, Atlanta Braves - He swings at too many pitches out of the zone but is becoming more patient and his power is improving. He is young enough that his breakout could be shockingly good. 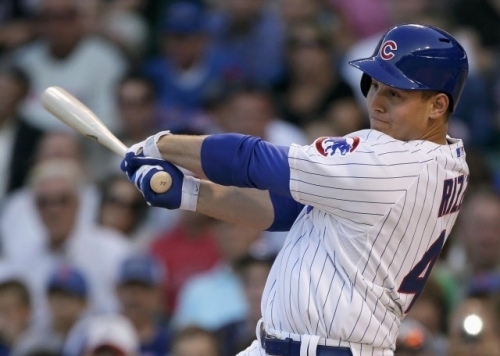 Anthony Rizzo, Chicago Cubs- Rizzo made nice improvements to his long swing and had another very impressive minor league season and a promising major league debut. Logan Morrison, Miami Marlins - Injuries have kept his promise under wraps. He has the skills to hit for power and average. He is a patient powerful and disciplined batter. Health and at-bats are the key to his breakout. Corey Hart, Milwaukee Brewers- Hart has solid power and a decent bat. His knee injury could mess up his base to start the season, so expect a slightly lower homer rate. Ike Davis, New York Mets - He deserves an article of his own. His power arrived in the second half of the season but he spent the first half recovering from the effects of Valley Fever. Ryan Howard, Philadelphia Phillies - His peak was not very long but it was great while it lasted. He still has big power but the batting average could be disappointing. Justin Morneau, Minnesota Twins - He finally appears to be healthy. He expects to get a full season of at-bats this season. If he gets them and recovers his former skills he is an MVP candidate. Lance Berkman, Texas Rangers - Berkman is brittle but very productive when healthy. He is aging quickly and is apparently just playing for the money at this point. Garrett Jones, Pittsburgh Pirates- A solid hitter with pretty good power. Unfortunately the Pirates are always trying to improve on him. Michael Cuddyer, Colorado Rockies- He's really the right fielder but he serves as Todd Helton's understudy at first base. Cuddyer is a five category contributor without any elite skills. Mike Morse, Seattle Mariners - Has big power but has yet to prove he can be a consistent contributor from season to season. Injuries have been a factor and his new home park could be intimidating. Hosmer's beard makes him look stupid. 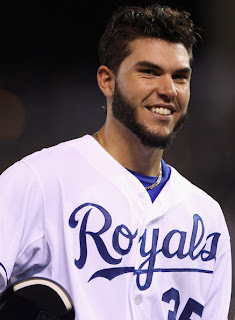 Eric Hosmer, Kansas City Royals - Everyone's favorite sleeper going into the 2012 season was a huge disappointment. His ADP still has him as a top 100 pick. He swings at too many outside pitches but he does have the patience to draw walks and makes strong contact. A good portion of his problems could be related to his .255 BABIP. Brandon Belt, San Francisco Giants - Belt has not exploded on the major league scene the way some prospect junkies expected. He draws walks but still swings at too many bad pitches. He is very BABIP dependent. Chris Carter, Houston Astros - The power has been obvious for a long time but the platoon helped him be a bit more productive hitter. The Astros can give him a ton of at-bats. He has some upside potential, if you want to understand his ceiling better read this Minor League Ball article. Yonder Alonso, San Diego Padres - Alonso had a pretty good full season debut. He showed patience and discipline at the plate. His power was a little disappointing but his 39 doubles hold some promise for greater homer totals in the future. A nice pick in leagues where you can be patient with him. The power will improve. Adam Lind, Toronto Blue Jays - The lineup around him is vastly improved. The expectations for the Blue Jays are higher than they've been in years and almost all the pressure if off Lind as the DH hitting near the bottom of the lineup. He showed improvement in the second half after his stint in the minors. Michael Young, Philadelphia Phillies - Had his worst season in the majors. It was not quite the fantasy disaster that it was for real baseball unless you drafted him based on his 2011 season. 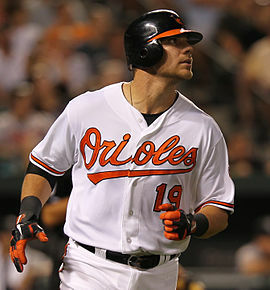 Chris Davis, Baltimore Orioles - He finally got a full season of at-bats and showed his power potential. He is not a great bat but the power is as real as it gets. I expect more of the same. Mike Napoli, Boston Red Sox - The news about his hip injury has been a bit blown out of proportion because of how anxious the Red Sox were to protect themselves. According to news that went under reported the condition caught early enough that treatment should be very effective. Napoli has been very productive in Fenway Park. Brett Wallace, Houston Astros - The Astros are determined to give Wallace as many at-bats as possible. Wallace spent some time in the minors getting his swing back and was quietly productive on his return. This kid has experienced a lot in his very short career. Adam Dunn, Chicago White Sox - His homeruns came back in a big way but his power adjustment did not improve his batting average much. Despite 41 homers his slugging percentage was just .468 as he hit just 19 doubles. He is closer to done than those in love with the homerun totals would have you believe. Darin Ruf, Philadelphia Phillies - If Howard were to go down to injury Ruf would be better suited to first base than the outfield role he is bound to have. Ruf is not an empty power hitter nor a one hit wonder. Some guys just take a bit longer to develop. He reminds me a lot of young Ryan Howard. Brandon Moss, Oakland Athletics - Based on his track record I will have to see Moss do it again before I'll have any faith in him. Mark Reynolds, Cleveland Indians - He has serious power and strikes out a ton. He is now is a lineup full of similar hitters. It should be fun to watch. Indian fans will want to wear windbreakers this season. Justin Smoak, Seattle Mariners - The Mariners are giving him another opportunity based on how he finished the 2012 season. He looks good this spring and the addition if veteran bats mean there should be less pressure on the young players in Seattle. 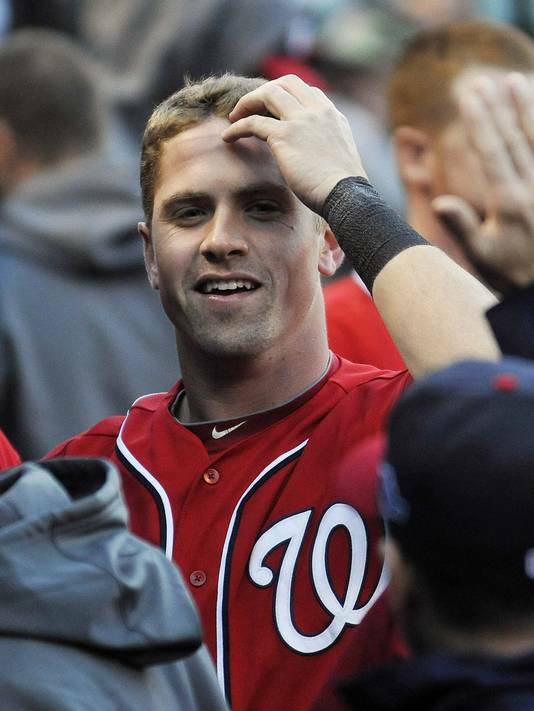 Tyler Moore, Washington Nationals - A player I like more than most people. Davey Johnson is not a huge fan of rookies and held off using Moore as long as possible in 2012. he knows that Moore can be a very productive bat now. He should have a bench role to start the season. Juan Rivera, New York Yankees - Rivera is not a great bat but thanks to the brittle and aging bats in the Yankees lineup Rivera should have plenty of at-bats this season. Todd Helton, Colorado Rockies - A former fantasy stud reduced to hitting for average and trying to stay healthy enough to complete his ridiculous contract. Matt Carpenter, St. Louis Cardinals He could be the starting second baseman if all goes right but he does not qualify there. He has some potential with the bat if he can find a position. Jordan Pacheco, Colorado Rockies - A decent hitter but he has no power and no start role. Gaby Sanchez, Pittsburgh Pirates - A better player than he showed in 2012. The Pirates will give him another opportunity to steal the first base job. He'll end up getting at-bats even if he doesn't start on a regular basis. Mitch Moreland, Texas Rangers - He has not improved while in the majors and looks to lose at-bats this season to Lance Berkman and eventually Mike Olt. Mike Carp, Boston Red Sox- A favorite sleeper from 2012, Carp is now a bench bat for the Boston Red Sox. He should find at-bats at first and the outfield corners. Casey Kotchman, Miami Marlins - Kotchman will battle Logan Morrison for at-bats but unless Morrison remains injured is unlikely to play much. Carlos Pena, Houston Astros - The new Astros designated hitter. His power is in decline and he has not hit for average in years. James Loney, Tampa Bay Rays - Why the Rays prefer James Loney to someone like Carlos Lee is a mystery. Loney does not hit for average or power anymore.